Composed by L. Ray Strobel. Full set. 65 pages. Duration 5 minutes. Published by Imagine Music - Digital (IZ.CBS1314). 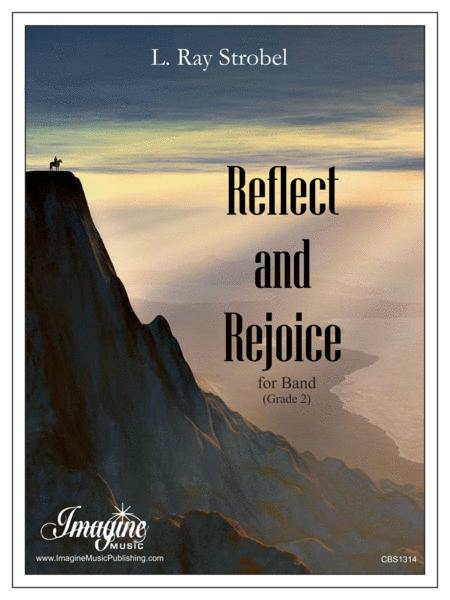 Reflect and Rejoice for concert band is Ray's first commission by director Paul D. Rogers and the band boosters of Manvel Jr. High in Manvel, TX. The music is meant to be simple and accessible, yet with ample opportunities for phrasing and expression. The first two thirds of the piece is a lyrical chorale, in moderate speed. The peak of the composition is not fully realized until the tempo changes for the last third of the work. Reflect and Rejoice offers many areas of growth for the mid-level band. Phrasing is emphasized within a wide range of dynamics. The tempo change will challenge the percussion. This composition provides opportunity for the section leaders to work their upper ranges, and the lower voices to carry melodies and counter-melodies. At over five minutes in length, this is a work to sink your teeth in and enjoy from beginning to end.